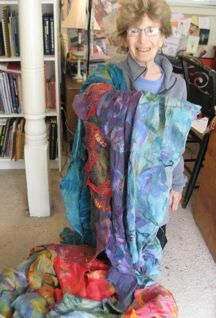 October 20, 2011 Ginny Huber will be the featured artist with her one of a kind nuno felted scarves at Manya Vee Selects, a Gallery in Edmonds, WA. The event is from 5 pm-8pm in conjunction with the Edmonds Third Thursday Art Walk. She will also be doing a demo/showing the materials used in the process and Manya will continue to carry her work at the Gallery after the 20th. To more examples of Ginny’s work please go to her website. FloweringFibers.com, still tweaking it a bit.